Do your colours fail to dazzle? Do your lines lack oomph? Sebastian Onufszak shows some nifty Photoshop and Illustrator tools for getting great results every time. 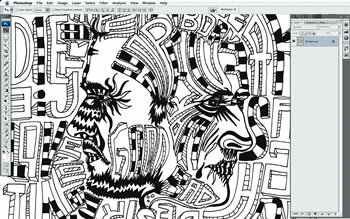 Creating an image this striking takes talent with a pen and paper, genius with illustration software – and a lot of planning. Here, Sebastian Onufszak guides you through how he created this poster-style picture, all the way from his first sketch to the finished composition. He’s provided the files so that you can follow along, or you can use a sketch of your own. On the way you’ll pick up some great tips that you can use in other Illustrator and Photoshop work – tricks such as tracing in Illustrator, how to use the Live Paint Bucket for stunning effect, and adding textures to give your finished piece an interesting, handmade feel. 01. 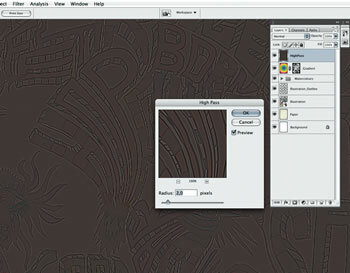 If you’re using your own artwork, do a drawing, scan in your sketch and open it in Photoshop. In this case I drew a black-and-white illustration with closed outlines. It is necessary to have a high-contrast artwork in greyscale. Use Image > Adjustments > Levels to optimize it. 02. 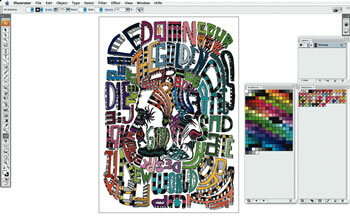 In Illustrator, open a new document (250-x-350mm, CMYK). Select File > Place and place either your drawing or 01_The_Golden_Age.tif from the cover CD into it. Select this image and choose Object > Live Trace > Make. 03. 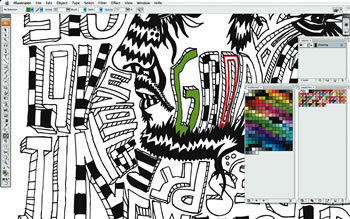 Instead of pressing Expand from the Control menu, use Live Paint for the next step. As you can see in this image, you can use the Live Paint Bucket to select each closed plain for colouration. 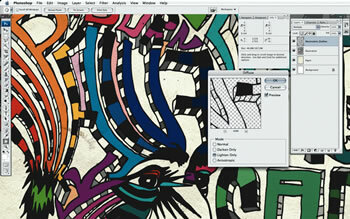 You can also directly trace your image to Live Paint by selecting Object > Live Trace > Make and Convert to Live Paint. 04. From the image resources you have on your computer, choose an image you like for its colours and open this file in Photoshop; if you’d rather use my colours, use Colours.tif from the cover CD. Select Filter > Pixelate > Mosaic. Move the slider until you’re happy with the colour range of the cells. Save this document as Colours.tif. 05. Now return to your Illustrator document with your traced illustration. Select File > Place from the menu and place your colour palette, Colours.tif. 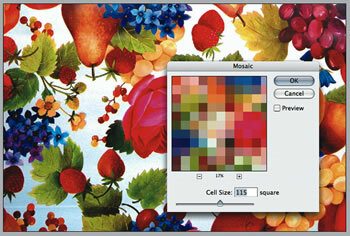 Select the image, then use the drop-down selection close to Live Trace to choose Photo High Fidelity, and hit Expand. Next, select Window > Swatches and open the Swatch Palette. From the Palette menu, choose Add Selected Colors. 06. You can also open an existing swatch palette, for example VisiBones2. Next, use the Live Paint Bucket from the Tool palette, and start to colourize by selecting your preferred colour and filling the closed plains. To make the words as legible as possible, use a similar colour range for the letters of a word. 07. Your result should be similar to this image, where every plain is coloured. Save the Illustrator document. 08. 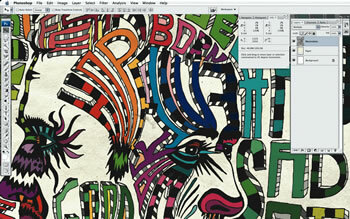 In Photoshop, open the Illustrator document or choose 03_The_ Golden_Age_Coloured.ai from the CD. 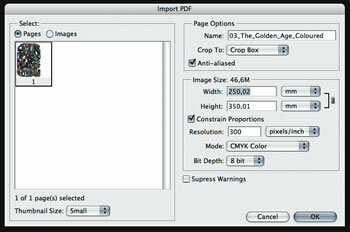 Select Crop Box from the Crop To menu, and specify a 250-x-350mm, 300dpi rectangle in CMYK colour. 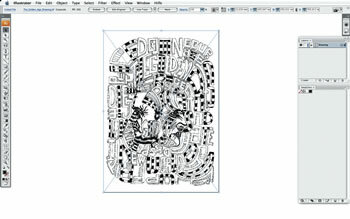 You can resize this Illustrator file however you like. 09. To achieve an aged, naturalistic paper look, open Paper_Texture.tif and place the image below your illustration layer, or choose another background image from your resources. 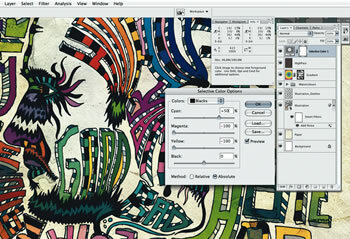 Select the illustration layer and set the blending mode to Multiply. 10. Duplicate the illustration layer and rename this layer ‘Illustration_ Outline’. Choose the Magic Wand tool with the following options: Tolerance 30, Anti-Alias ticked, Continuous unticked and Sample All Layers unticked. Now select the black outlines, invert and delete the selection. Then use the filter Stylize > Diffuse for a raw outline. 11. The next task is to manually create some random-looking watercolour drops, spills and splashes. 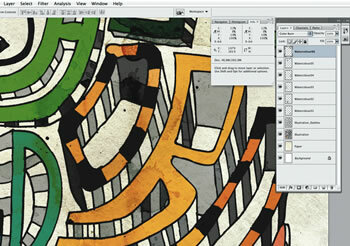 Scan your paintings into Photoshop, place these above your illustration layers. 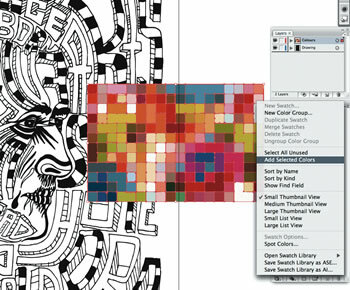 Adjust the blending mode for the watercolour layers to Color Burn or Darker Color, as necessary. Repeat this step until you’re happy with the effect. 12. Create a new layer and select the Gradient tool. Choose an existing gradient swatch or create an individual one. Then fill the layer with the Radial Gradient and change the blending mode to Soft Light. To reduce the effect add a layer mask and brush some areas where necessary. 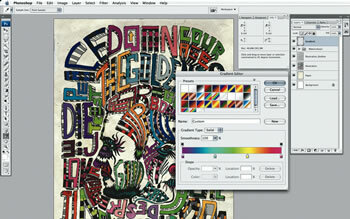 The aim is to create a soft gradient for the coloured words and give your artwork a natural look. 13. Now select all and choose Edit > Copy Merged. Then select Filter > Other > High Pass and drag the slider to a value of 1-3. Adjust the blending mode to Hard Light to emphasize the dirty look. 14. The last filter effect we’re going to use is Noise > Add Noise with an amount value of 1 for the illustration layer. 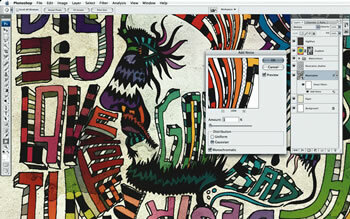 For better control, convert this layer for smart filters by selecting Filter > Convert for Smart Filters. Now you have the option of turning the effect on and off. 15. Finally, create a new adjustment layer at the top by choosing Selective Color. Select Blacks and drag the sliders for Cyan to +60, Magenta to -100 and Yellow to -100. 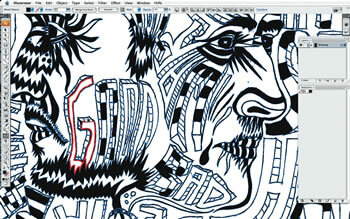 Now the black outlines look more intensive and integrated with the whole artwork. Who: Born in Breslau, Poland in 1978, Sebastian Onufszak is a German visual artist focusing on print, interactive media and motion graphics. He works as an art director and freelancer for range of international clients. 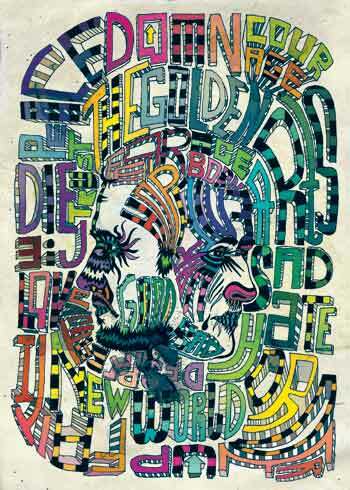 His work was featured in numerous publications and exhibitions worldwide. He currently lives in Dusseldorf, and and works for Parasol Island, an animation and design studio, as creative director. Download: All files for this tutorial can be downloaded here or are available on the cover CD.